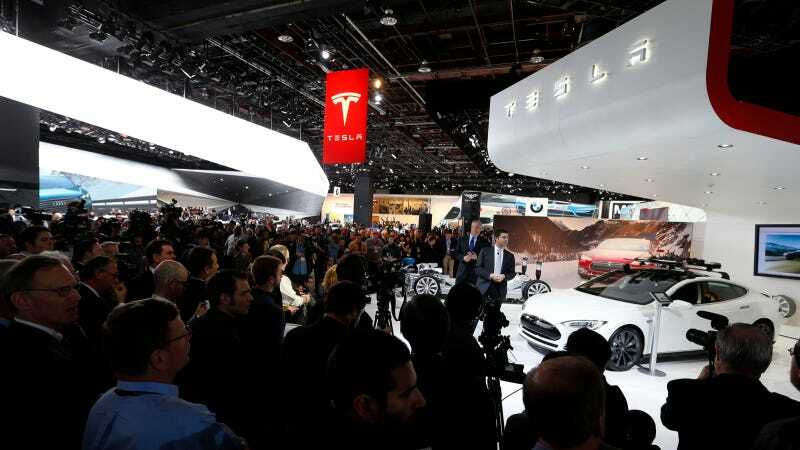 Tesla's VP of Worldwide Sales and Service Jerome Guillen was kind enough to take questions after the least eventful press conference I've seen at the Detroit Auto Show, but he "does not know where rumors came from" about a utility or pickup from his company. Those rumors came from Elon Musk, who I've heard is important to Tesla's operation. He told Business Insider a few months ago that the company might make a truck in five years. But before I could cite that in retort, the Tesla team revoked my microphone privileges, leading a wave of shaming laughter and finger-pointing in my direction. As I tearfully stormed away I heard that the only future plans Tesla was willing to reveal were that Model S-based crossover, the Tesla Model X, is "being worked on furiously" and an economical model is planned for sometime in "the next three years."